Millennials, who are now between the ages of 24 and 38, comprise 42 percent of the nation’s home buyers* and 61 percent of first-time buyers. Fifty-four percent of buyers who seek financing are somewhat or very concerned about qualifying for a mortgage, and just over half of buyers (52 percent) put down less than 20 percent on their purchase. Millennials receive more help from family and friends when gathering their down payments than other generations. For every $5 a Millennial buyer uses for a down payment, $1 is a gift or loan from family or friends. Younger generations tend to place greater importance on neighborhood diversity than older generations: 48 percent of Gen Z buyers and 42 percent of Millennials say living in a racially diverse neighborhood is very or extremely important to them, compared with 28 percent of Gen Xers, 18 percent of Boomers and 22 percent of Silent Generation buyers. More than half (53 percent) of sellers* are selling a home for the first time. If it seems as though sellers have the upper hand in today’s housing market, consider this: 83 percent of sellers make some concession with buyers in order to close the sale, and 41 percent have at least one offer fall through. Sellers in suburban areas have the shortest selling time, which isn’t surprising given separate research that shows the American affinity for suburbs. Sellers in rural areas, where fewer buyers translates into less demand for homes, experience the longest listing times before selling (4.1 months compared with 3.1 months for urban sellers and 2.6 months for suburban sellers). Nearly half (45 percent) of homeowners* still live in the first home they purchased. The median length of time homeowners have lived in their homes is 16 years, and the majority (83 percent) have no plans to sell in the next three years – which doesn’t bode well for a flood of inventory hitting the market any time soon. 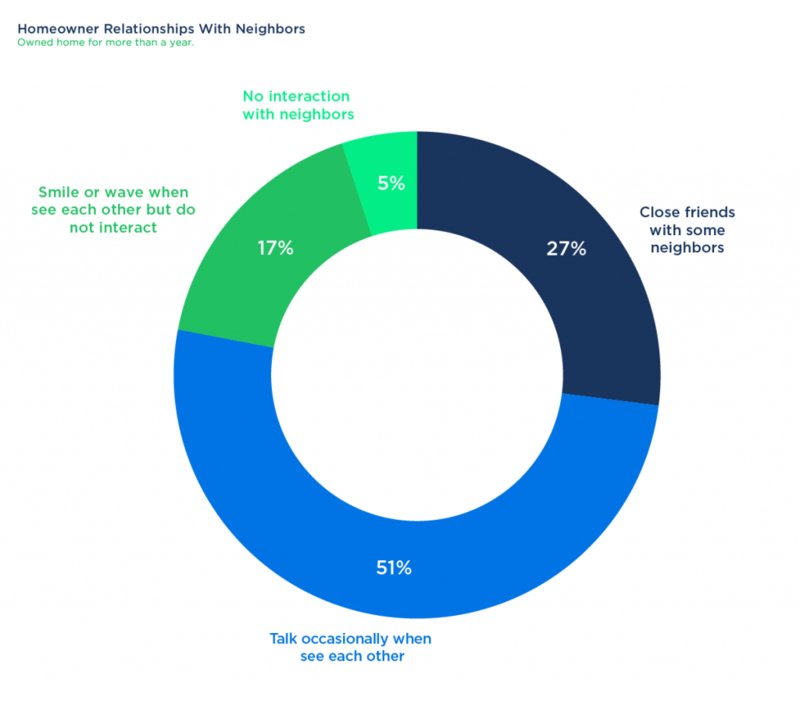 More than a quarter (27 percent) of homeowners say they’re close friends with some of their neighbors, compared with 21 percent of renters who have been in their home for more than a year and 17 percent of renters who are new to their home in the past year. 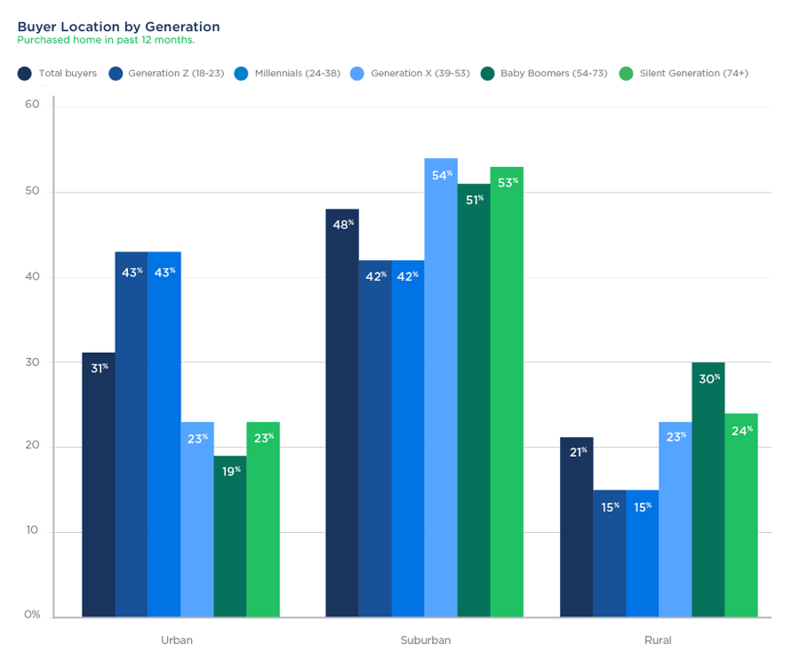 Contrary to their reputation as urban denizens, more Millennial homeowners live in the suburbs (55 percent) than rural settings (23 percent) and urban areas (22 percent). Despite the growth of the short-term home rental market, 96 percent of homeowners say they don’t rent out their primary residences and have no plans to do so. But this could become more common, given the importance younger buyers place on the opportunity for rental income: More than a third of both Millennials (36 percent) and Gen Z (35 percent) buyers say it’s extremely or very important to have the opportunity to rent a portion of their home for rental income, well above the share of homeowners in older generations. 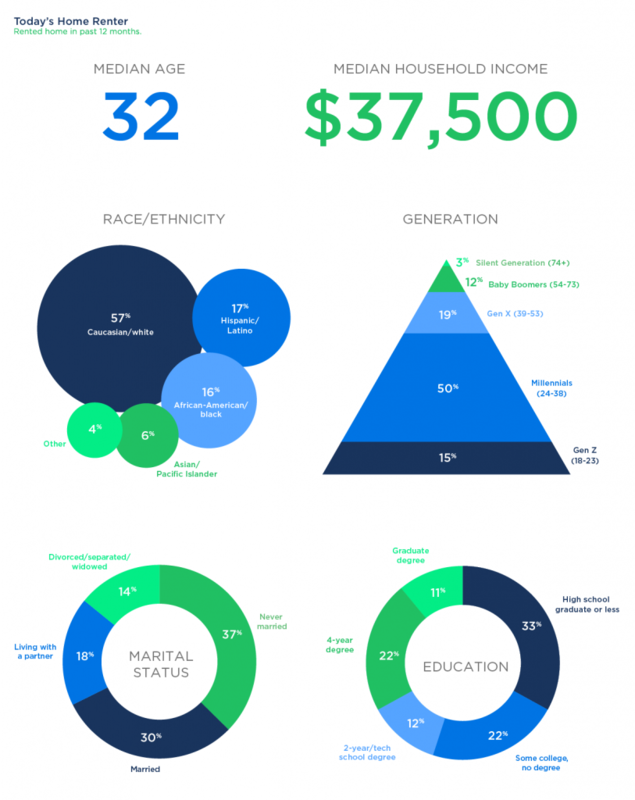 Millennials and Gen Z account for 65 percent of renters* who moved in the past year, and constitute the most racially and ethnically diverse households in America. Nearly 8 in 10 renters (78 percent) who move from one rental to another experience a rent increase prior to their move. For about two-thirds (69 percent) of those renters, the decision to move is tied directly to a rent increase. People of color are more likely to say a rent increase affected their decision to move, because they are more likely than white renters to experience rent increases. Seventy-three percent of white renters experienced a rent increase at their previous rental compared with 85 percent of black renters, 87 percent of Asian renters and 85 percent of Latino renters. A significant share of rental households is one large expense away from being unable to pay the rent. Nearly half of renters (48 percent) can’t accommodate an unexpected expense of $1,000. Gen X renters are the most vulnerable: Only 44 percent of those renters say they can cover an unforeseen expense of that magnitude. The situation is more precarious for rural renters: Only 36 percent say they could come up with the money to cover an unexpected expense of $1,000, compared with 54 percent of both suburban and urban renters. Families with children under 18 fill out 2.4 times as many applications (4.8 applications on average) as solo renters, while people with pets fill out 1.6 times as many (4.0 applications on average). *For this analysis, buyers are household decision makers who moved into a home they purchased within the past 12 months. Sellers are those who sold a home that was their primary residence in the past 12 months. Homeowners are those who own and have lived in their home for more than a year. Except in the bullet point about neighbors as close friends, renters are only those who moved to a rental home in the previous 12 months. The bullet point regarding neighbors as close friends includes responses from longer-term renters.